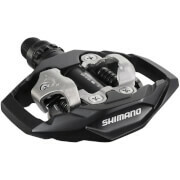 Shimano M530 SPD Trail Wide Pedals (OE) are value for money dual-sided SPD pedals, perfect for cross country trail riding. This trail pedal is ideally suited to tackle single track and ultra-technical descents with control and confidence. The large integrated cage provides excellent pedal to shoe contact, increasing stability and control. Packaging may vary, cleats included.